Be the first to share your favorite memory, photo or story of Darren. This memorial page is dedicated for family, friends and future generations to celebrate the life of their loved one. 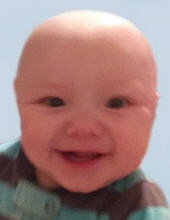 ALEXANDRIA, IN- Darren W. “Baby Darren” Bagley, 6 months, joined the angels from his home on Wednesday, February 6, 2019 unexpectedly. He was born on July 8, 2018 in Muncie and received lots of love from his family while here. Family and friends are invited to a gathering time in honor of Baby Darren on Monday, February 11, 2019 from 4 pm to 5 pm in the Owens Funeral Home, 412 North Harrison Street, Alexandria. To send flowers or a remembrance gift to the family of Darren W. "Baby Darren" Bagley, please visit our Tribute Store. "Email Address" would like to share the life celebration of Darren W. "Baby Darren" Bagley. Click on the "link" to go to share a favorite memory or leave a condolence message for the family.